Christmas came early for Mississippi state champion Oak Grove High School, but that wasn’t Santa Claus with them, that was offensive coordinator Brett Favre. 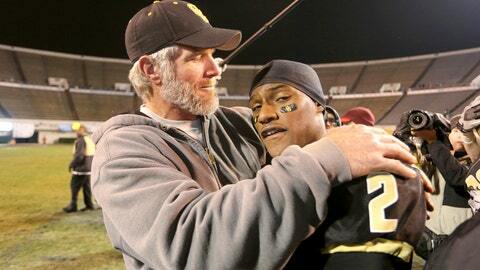 Favre, sporting a playoff beard without a drop of Just For Men, helped lead Oak Grove to a 14-7 win in the 6A championship game. Looking at those whiskers, it’s hard to believe his name ever was discussed by an NFL team this season, and easier to accept that this is his first title since winning the Super Bowl in 1997. He looked more like a surgeon general than a field general. "I can’t say it’s the Super Bowl, but it’s pretty close," Favre told reporters. "It really is. It’s a different kind of feeling, but I’m awfully proud of these kids." Favre couldn’t take credit for the go-ahead TD, which was scored on a fake field goal. "That was all the special teams’ coach," Favre said. "I don’t call trick plays." Enjoy it while you can, Brett. Apparently they’re killing you off in Season 6 of "Sons of Anarchy."